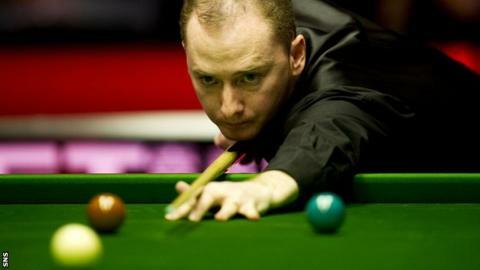 Graeme Dott said he is the man to avoid after becoming one of three Scots to make the World Championship. Dott, a winner in 2006, came through three-best-of-19-frame qualifying rounds to join Alan McManus and Anthony McGill at the Crucible tournament. "Nobody's going to want to draw me," said Dott, who beat Mark Owens, Fraser Patrick and Yu De Lu. "Normally, when I'm in the 16, I'm the player everybody wants to draw, but they're not going to want to draw me." The 37-year-old was unhappy at the rule changes introduced by World Snooker chief Barry Hearn. Only the world's top 16 qualifying automatically, meaning 128 players were put through qualifiers. "Of course it's not fair," said Dott. "You've got debates on the television for politicians. If you had a debate between Barry Hearn and me and the public actually heard what I'm trying to say, how could anybody think it's fair that Michael White finishes 17 and he's three rounds behind the guy who's 16. Obviously it's not right. "I'm not saying anybody's going to be intimidated to play me, but there's certainly going to be easier games than me, so they're not going to want to play me." Former semi-finalist McManus beat Mitchell Mann 10-6 to qualify for a third straight year, but he said he was happier for protegee McGill, who earned a Crucible debut with a century break to beat Mark King 10-9. McManus and 24-year-old McGill are training partners. "I'm more pleased for Ants getting through than I am myself, that's the god's honest truth," said McManus. "So proud of the boy. He's such a good player, you've no idea how good this boy is. "He's going to be in the top 16 sooner rather than later, there's no doubt about that whatsoever. He's got every tool in the box, it's just all there. "One thing I've always thought about the Crucible, it's tailor made for some guys. "Your Robertsons, your Selbys, it's tailor made for them, they're temperament, their attitude, their work ethic, it's all a package. There's so many great players who have gone there and never won a match. "Ants' going to go there and do some damage, maybe not this year, but he's going to do some damage. "I've tried to give him advice because I've walked the path having been a pro for quite some time. I've seen guys go that way or that way and I've seen guys go up the way. "I know what their habits were and what they do or don't do, who they mix with, who they don't mix with, so I tell Ants all the time if I see something that's not going to help him."